Georges Trubert supplemented the basic story of the Holy Family's flight from Herod's soldiers with representations of miraculous, apocryphal accounts popularized during the Middle Ages. A golden column in the background partially supports a pagan idol that toppled as the family passed, an indication that the Messiah's coming doomed pagan religions. In the story of the miracle of the wheat field, shown to the left, the Holy Family passed a newly sown field of wheat while fleeing, and it miraculously grew to full height. Later, soldiers pursuing the family asked a farmer when the travelers had passed; though now harvesting the same wheat, he truthfully replied that he saw them when the wheat was planted. Discouraged, the soldiers turned back. The narrative unfolds from back to front, suggesting the family's progress on its journey. 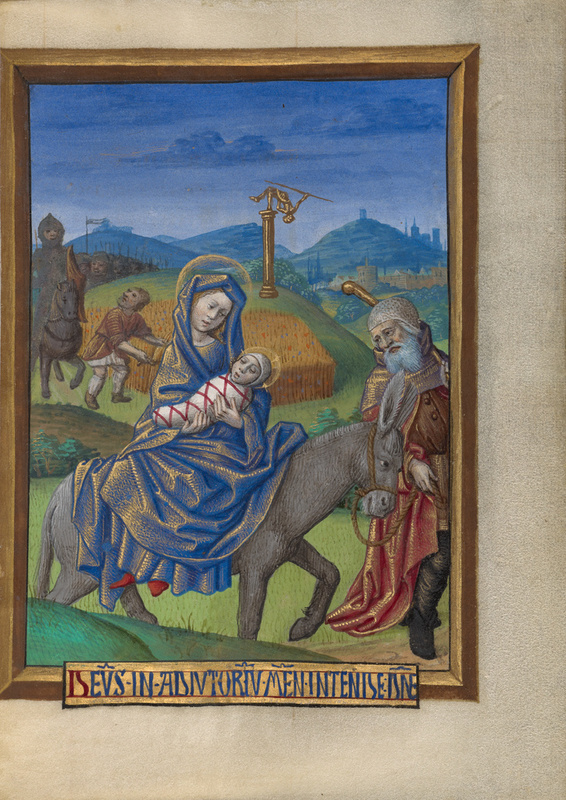 This movement continues in the foreground as the mule, depicted mid-step, carries the Virgin and Child, while Joseph, partially hidden by the miniature's frame, begins to disappear from sight.